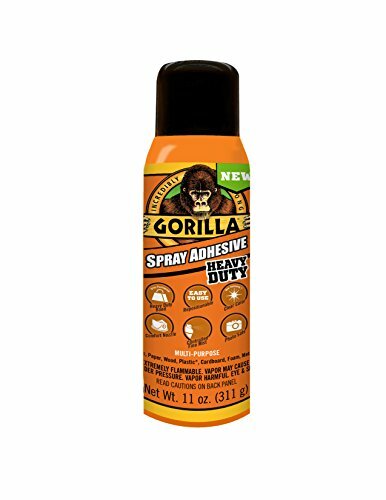 Gorilla spray adhesive is heavy duty, multi-purpose and easy to use. While repositionable for up to 10 minutes, Gorilla spray adhesive forms a Clear, permanent bond that is photo safe. Its wide pad nozzle and controlled fine mist provide an even application on the project you are working on. BONDS - Wood, Metal, Fabric, Foam, Plastic, Paper, Glass Leather and More! View More In Cyanoacrylate Adhesives. If you have any questions about this product by Gorilla, contact us by completing and submitting the form below. If you are looking for a specif part number, please include it with your message. 3M Scotch-Weld 07176 Plastic & Rubber Instant Adhesive PR100, 4.4 lb/2 kg Bottle, 67.628 fl. oz.